It’s time for BART to revamp its signage. San Francisco is the design epicenter of the West Coast, but its subway station labels are cringeworthy. The original hanging Univers placards are okay (despite the clumsy spacing), but you can’t always see them from the train interior. In a awkward attempt to compensate for this oversight they’ve slapped two disparate signs to the wall; one, caps from a bad cut of Futura; and, more recently, an inexplicable white Arial on gray. After a few months in Stockholm’s excellent system, experiencing the BART design was almost like a visit to the third world. Update: In 2011–12, BART is phasing in new signage using Frutiger. It’s dull and nonspecific to the region (like most systems based on this overused typeface), but much more effective than before. This is all the work of these brilliant kids coming out of school and working for ‘sign shops’. It is the plauge of the century. Plauge of the Century = my new band name. That was my nickname in high school. I just moved out to the bay about 4 weeks ago, and I know exactly what youre saying. Are there any good signage systems in the US? Have any been updated since the 70’s? I’ve only been to mostly east coast cities (DC, Boston, NYC) and Chicago. DC’s was the best in my opinion, but certainly not amazing. All, to my knowledge, used Helvetica. Maybe this is just BART’s attempt to cover the other big 3 san serifs so all are represented? Apple, Adobe and Wells Fargo should step up and pay for new signs – requiring that they use all Myriad (real version not the iPod version). That would be nice. I’m sure funding is one of the roadblocks. Myriad is a little too pedestrian for SF. I was thinking something custom, designed by a local. Jim Parkinson did a fine job with the Chronicle, let him make a new font for local signage. Maybe something like Richmond (one of his many types named after Bay Area cities). It doesn’t share the co-branding possibilites with Myriad, but it certainly looks more SF. does that word really exist? Maybe it’s something I’m not getting, but I thought you meant plague, as in bubolic. Bad public time certainly qualifies as a plague, infestious as it is. All architects know is CAPS, and engineers (i.e. the people running transit systems) prefer caps as they are bigger. Which for an engineer means stronger and safer and thus more effective. The arrival of Arial means that the accountants are taking over from the engineers. Which in turn means fewer trains, higher prices and even worse type. There are examples of good public type, but I can’t think of one in the US. For Berlin we did a condensed version of Frutiger (which wasn’t available back in 1990) and named it Transit. For Duesseldorf airport we designed FF Info. Cologne airport just had an interesting face designed for them by Ruedi Baur’s office. A few years ago, MetaDesign in SF did a presentation of what the signage could look like on BART. To no avail, apparently. 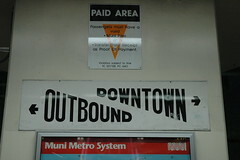 >A few years ago, MetaDesign in SF did a presentation of what the signage could look like on BART. I wonder if parts of this could be posted on the web � with an online petition where ordinary SF residents and notable celebrities could log their support for a redesign? Or perhaps that would just serve to annoy the decision makers. Or perhaps it means the signage system is so utterly broken that non-designers are taking things into their own hands. does that word really exist? Maybe it�s something I�m not getting, but I thought you meant plague, as in bubolic. I’ve thought (and said) for years that BART needs a new wayfinding system. The originals were all Univers, and it probably looked really good in the 60’s. There are more things besides the type that need help. The names of the different lines actually change every few years as they are extended and new stations are added. The farther away from the busy core of the system, the more meaningless the names are to the core riders. How about color-coded lines, like in Boston and elsewhere, since the system maps already have those colors? And good luck finding a system map once you’re on the platform! I feel sorry for newcomers trying to get somewhere on BART; if you don’t understand the entire Bay Area already, it’s like a secret society. Allow me to add to that. It seems EVERYTHING I see coming from architects on the west coast is all lower case impact, with a 50% letter spacing. That in my mind is “architect typography”. Count your blessings, Kyle. Could be Tekton. Don’t you worry. Tekton is a very close second. I work for a sign company, so I’ll offer my two cents (and then some). The hodge podge, inconsistent feel of the BART sign system is very likely the result of lots of different signs ordered and installed at different times, from different sign companies and probably bought from either the low bidder or whoever could get the display installed in the fastest amount of time. The idea of adhering to a consistent typographic theme probably could not have been less important. Just get the work done and get it done cheap. This is the reality of commercial signage in the United States. First of all, the sign industry itself has very little glamour. So it doesn’t attract the best talent. Few go to art school with the intention of working in a sign company after graduation. I count myself as part of a slim minority of sign designers who have a four year degree. Few businesses take signage seriously at all either. This is despite the fact a business will get more exposures per dollar spent on signage than any other form of media. The US Small Business Adminstration website even backs that up with very detailed legal studies. There’s still very little glamour in signs, so the majority of businesses refuse to invest properly in them. Great looking signs, appealing way finding systems and visually pleasing store front identity all cost money. And I think that’s money most people are not willing to spend. The “let’s do it cheap and fast” strategy in signage just rots away a city’s commercial landscape until the community itself gets disgusted enough to do something about it. Often the results of that disgust are equally as bad: draconian size and square footage limits that do nothing to improve visual quality in signage. It’s rare to come across a sign ordinance that was put together with much intelligence at all. My observation is most people doing the design work have no formal design education or training at all. This gets back to the point about poor investment in signage. How can anyone expect great typography out of most sign shops when most shops can’t afford to hire degreed designers. There’s also no shortage of no-talent amateurs willing to commit font murder on a daily basis for $8 an hour. Tell me about it. The problem I see here in the Bay Area since I’ve been here is the fact that there are different transit systems that intersect each other. You’ve got the MUNI, BART and Caltrain (and there are others I believe). When I was working on my Thesis project revising New York’s system I found many problems, but the problems I see in the Bay Area are a lot larger than replacing signage. There’s governmental issues at play here on both the state and local level. The systems themselves are not very expansive and run at odd times. I think money might be better spent in structuring a more comprehensive transit system. I would attribute this kind of poor city planning to state, local (and maybe even the federal govermment) not talking to each other. If MetaDesign couldn’t convince BART to change, and based on some of what Erik said when he was in New York, I’m inclined to say that there’s a long road ahead for any change in regards to signage. Thanks for the perspective, Bobby. I worked in sign shops for years as well. Signage definitely takes a backseat to any other architecural design issue. I’m constantly seeing new, award-winnning star buildings like museums, train stations, etc. by star architects labeled with badly-spaced Arial or some other flaccid typographic measure. It’s been written about extensively (Wayfinding: People, Signs and Architecture), but the awareness hasn’t penetrated at all. Don’t mistakenly ascribe bad typography to sign shops; the institutions that order the signage are to blame. Very few sign shops are given real design work anymore. More often, designers depend on the sign shops simply for product. Again, the problem is bigger and more systemic than signage. In the U.S., Design is still not widely recognized as an aid to accessibility, traffic, ridership, P.R., navigation, and safety. Not to mention civic identity and all the aesthetic benefits. Well, there’s lots of occaisions where sign companies are given tasks that demand real design skill and a high quality finished product. The broad problems in the sign industry get in the way of that. Architects? Hehe, that’s a good one. I have a nice problem-child of a building sign design project right now. The building owner mandated all tenants must use channel letter signs lighted with 15mm neon. Great. But the building was designed with so many ornate features and obtrusions that there’s little room for any of these signs. You might be able to fit a Starbucks logo into some of the nooks and crannies. But that’s about it. Durp! We’ll have to extend steel fixtures from the building to provide any kind of mounting surface. This is one example that exposes a great disconnect between various design fields. Commercial architects and sign companies need to work much more closely together. They need to think about the sign plan when the commercial building is in its design stages. Nearly all of the time, I get a sign design project when the building is only 90 days away from opening. That’s just backwards. Another disconnect is in brand identity schemes put together by traditional design firms and ad agencies. It is rare for such ID programs to consider outdoor signs into the mix. It seems only the largest and well known of retailers do that. But then maybe that’s one reason why they’re the largest and most well known! I lived for 6 years in the Bay Area and what I found was a lot of design job snobbery. It was acceptable for the designers coming out of school to work in house or for a public agency. If you couldn’t get a job at a premier studio, you worked at your local coffee shop or the (more recently) the Apple Store and waited for the “perfect” job to come up. This also made LOOKING for a job in the Bay Area nearly impossible because you never knew who was in the market. As a result, I always found the everyday graphic design — Signage, Menus, the detritus printed by your bank and even the newspapers, SEVERELY lacking. Now that I’m back on the East Coast, I find that there isn’t the design that really pushes the boundries like in the Bay Area, but that the design I interact with everyday is far better. Take for instance DC’s Metro system or NYC MTA, both of which have enforced a strict and consistent design vocabulary. In part, because good designers work for those agencies and not the kids coming out of third tier and junior colleges that work for the public agencies in the Bay Area. Schooling is another problem as there aren’t strong publicly funded art school/graphic design programs in the Bay Area like we have in Virginia or in New York. I guess if you’ve borrowed $40K+ for your art schooling, who is going to want to work their way up at a public agency. You should also know that I worked for a sign company in middle school. I have two very close friends who own sign companies with half a dozen different locations. I can tell you for certain that one of these companies employees six “designers” all which have a 3-4 year degree in “design”. Either way, my point is not too single out anyone. It is really apathy that is the culprit here. In part, because good designers work for those agencies and not the kids coming out of third tier and junior colleges that work for the public agencies in the Bay Area. I must respectfully disagree. There was once a time when New York’s system was created by good designers, but this is not so any further. New York hasn’t had a revision in over 30 years. While DC’s system is probably the best transit system in the U.S. they still use Helvetica for all signage. A good design vocabulary or identity should not make use of a typeface so widely used and featureless as Helvetica. Now that I�m back on the East Coast, I find that there isn�t the design that really pushes the boundries like in the Bay Area, but that the design I interact with everyday is far better. Terry, I think you are way off the mark here. Helvetica is a perfectly fine typeface for directionals and other wayfinding and locational markers. I cannot agree with you that its regular (mis)use makes it mediocre. A typeface does not have to be unique or always well-used to be useful. But then again, I suppose I am suspect, because I’m one of those designers who deigns to work in the public sector. Wait, JLT, I know you don’t really want to see one typeface in every city. We need local public transit signs with local character. The proliferation of global chains has already created homogenous signage on the streets. The least we can do is create city-specific character in our public places. I agree with JLT’s call on Helvetica. The choice of typeface is not the determining factor on whether a design is good or bad. Rather, it is how the type is used. Slamming Helvetica for its overuse seems pretty silly to me. I prefer to slam bad use of it instead. It’s also very impractical to demand that way finding sign systems all boast unique “city-specific” type. The signs shown in those BART photos are pretty cheap. You can’t hire an acclaimed type designer like Jim Parkinson to create a new font for a little job like that. There is a budget-driven perspective involved. I would just be happy if the sign companies had stayed with some consistent font, be it Univers or even (Lord forbid) Arial. To get to who is to blame for bad sign design, it isn’t typically new art school graduates. Sign designers typically fall into two camps. Camp one: a worker with no formal art training hired to run a vinyl cutter and apply graphics. Camp two: a veteran sign maker that graduated from camp one and stayed in the business for a long time. The camp two guy may even own his own sign company. Members of both camps often approach the trade like a kind of “shade tree mechanic” garage oriented business. In that venue, things like well thought out typographic design seem to matter only to a limited few. There is a blue collar culture in place that bristles against educated design philosophies. I would agree there are large sign firms with degreed designers who have developed a sense of apathy in design. That usually occurs on projects that have little importance or profit margin involved. Apathy can kill a sign company because the attitude bleeds over into finished product. This factor can occur in any design oriented business, not just sign companies. Sign designers have a huge responsibility to our commercial landscapes. But the professional is treated with such a lack of importance that I frankly feel many have no right to complain about the bad results we’re seeing. A bad newspaper or magazine layout will be in the trash and forgotten after a few days. Design a sign badly, and it can be on display for years or even decades. Such signs accumulate. Their combination with others that have fallen into disrepair can plunge an entire commercial zone into a morbid condition of blight. The least we can do is create city-specific character in our public places. Amen, Stephen. That’s all I’m really saying. I’m not a Helvetica basher, I think it has its purpose. But it is often the default face for public spaces and I think that’s just not always appropriate. For U.S. mass transit to constantly use Helvetica basically means that these cities share the same identity system. What’s unique about that? Every city has its own flavor and the use of type I think should also reflect that. Its no different to me than a corporate identity system. >Helvetica is a perfectly fine typeface for directionals and other wayfinding and locational markers. Well, no. The closed form of its numerals lends itself to confusion between the 3,6 8 and 9, which look too much alike at a distance. That is one reason, I believe, that Erik Spiekermann designed FF Info–originally a wayfinding font, as he says above–with more open forms that are less easily confused at a distance. Also he took care to distinguish the l and I, unlike in Helvetica. Further, the heavy weights of Helvetica are often used, and these exacerbate the problem. I believe that the scientific tests of the Clearview of James Montalbano proved that more moderate weights are more legible. As to the costs of commissioning a face, I suspect it is small compared to fabricating and installing, but in any case, there are a lot of more suitable fonts than Helvetica. Helvetica can be a good display face, though I personally think it is so overused as to need a very long rest. I’d like to see the unique city-specific theme occur in transit way-finding signage systems. But having been in the sign game for more than a decade, I’m simply at the point of begging for more basic design competence in the field. 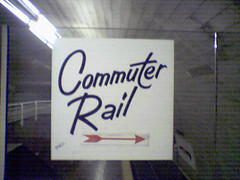 With a proposed transit system, the sign program would need to be worked into the station platform designs well in advance. Too often, signs are little more than a tiny after thought. The design theme of a transit sign system must be enforced with an iron fist. Lots of people in various parts of the food chain try very hard to make stupid deviations to an otherwise consistent plan. It’s obvious this has happened with the BART sign system. It’s more difficult to visually overhaul an existing sign system. Often the client will want to re-use existing sign backgrounds to save money. You get the best results by throwing the proverbial baby out with the bath water. Back to Helvetica, yes it is overused. But in signage, Arial is the real overused typeface. Most sign shops use Windows-based machines, of which Arial is the default sans-serif face. I prefer to slam bad use of it instead. Which is exactly what I’m arguing. We need local public transit signs with local character. I agree. Design for transit systems to me is no different than corporate identity systems. Using Helvetica as the default typeface for wayfinding applications I see is a disservice to the profession particularly when there are many other typefaces to choose from. In my opinion (narrow as it may be) using Helvetica for any new mass transit systems in the United States is a BAD use of the typeface. There’s also a legibility concern here, and the closed letter forms of Helvetica and Univers can cause legibility problems for people who are optically impaired or elderly. That I don’t think can be argued. If the argument is that public spaces don’t always need “local” color than the least that can be done is to choose a typeface that has been created and/or optically tested for legibility. If these transit systems were using Frutiger instead of Helvetica for instance, there’d be a lot less arguments. Terry. Just because New York or DC’s Metro hasn’t updated it’s wayfinding in 30 years, doesn’t mean it needs to. In fact there is a strong environmental argument to be made that changing all the signs would just create more waste. Why fix it if it isn’t broken? I do think, however, that WMATA (the Metro) and the MTA (NYC) have done a better job over the years of reinforcing their brand (as we’d call it now), sticking to and enforcing their design standards. BART in the SFBay Area has a strong map, a pretty decent (and retro!) logo but has not held strongly to it’s original design standards. The kerning gets worse and worse and isn’t consistent across stations, for instance. SFMuni (whose logo was done by Landor, originally) is marginally better. They have moved from their original (1970s-era, Landor specked) oranges to more contemporary reds, greys and blacks, but otherwise have been strong in their respect for their visual identity. I’ve thought about my design school snobbery (that may have unintentionally) come through in my previous post and realized that I wanted to say that there should be nothing wrong with public or junior college design programs, but the design snobbery throughout the Bay Area, extends to where professionals teach, as well. Unfortunately, while it might be okay for a seasoned pro to teach at the Fashion Institute of Technology (part of New York’s junior college system). It is not considered a feather in your cap to do the same at San Francisco’s City College or Oakland’s Laney College. That’s unfortunate in many, many ways. 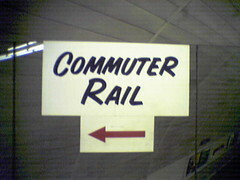 Speaking of abysmal subway signage: has anybody seen the signs for the new MBTA (Boston) Silver Line? In some places it nicely mimics the venerable old white-Helvetica-on-line-colour-background. Elsewhere, though (especially on the Blue and Orangle Lines), the signs are a hideously distorted deco-esque font�with black-white gradient fill�against some “wing” themed graphic. I wish I had a picture of it. It’s truly monstrous. They are hand painted. I noticed it immediately, but kept doubting myself, and checked and rechecked in every station I was in. I love them, and they’re really visible. Marian, those are gorgeous. I’d love to see more. John Downer strikes again! Although that S and the spacing might be a bit too inconsistent to get his okay. I wish I had taken more, but alas, this is the only one. Anyone in Boston willing? I’d been admiring those Boston area signs myself. I’ll see if I can get some pictures up in the next few days. I like Stewf’s idea of the BART signage having local flavor, but you’d have to keep in mind that few BART stations look alike (unlike DC Metro, if I recall correctly) inside or out, and so whichever better-than-Helv face would be chosen would have to be flexible enough to work well in both Montgomery and Dublin-Pleasanton, for example. Though on the Parkinson tip, I’m sure I wouldn’t mind seeing Modesto wherever I go, but it would have to be paired with something neutral. I will say this in BART’s meager defense, though — I always thought the system maps were things of beauty, even with their jagged land-mass edges. A different kind of beauty than the Underground system maps, to be sure, but beauty nonetheless. I think the real issue here is that these railway agencies (BART and Muni) are running on fumes and will barely spend enough money to operate on a daily basis, let alone shell out the for some better, more consistent signage. The systems are rife with and cost-cutting and bandaid solutions. Today, you’d be lucky to find a manned Metro booth, or get a speedy repair of a BART ticket machine. I’m not expecting new signs to show up anytime soon… not as long as the services remain adequate without excelling at anything other than keeping the trains running close to schedule. It would be nice if California would invest in a new signage system, but they have bigger fish to fry. Don’t expect it to get done while the Kindergarten Cop is in office. As someone who has lived their entire life in America, I have to play the devil’s advocate for the BART signage. Using Meta with color-coded pathways may seem to make perfect sense to most designers, but I think a lot of Americans see this as being “European” (translated as “uppity,” and thus distracting). The true test of signage is if it serves its purpose, yet goes unnoticed by the general public. American type may be ugly, but we’re used to it. If I get up tomorrow and all the signs are changed, there’s going to be a lot of accidents, and a lot of people missing their train. A sign that goes unnoticed has little reason to exist. It, in essence, a fails to function. This is especially true for any business oriented signage. Signs must tell the public “this business is here,” and do so in a visually responsible manner. While some want more creative and tasteful use in type for signs, I’m just wishing for basic levels of competence in type design from most sign companies -particularly all those little fast signs vinyl cutter only shops. Wayfinding sign systems do need to be designed in a more restrained, tasteful fashion. Making them “invisible” is perhaps a bad term. 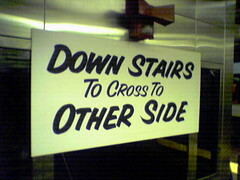 Most of us may agree wayfinding signs and their type used should have more harmony with their respective environments. It’s okay for a neon sign for Chili’s to blaze the eyeballs. The sign for your stop on the subway should not. The trouble is most folks designing signs don’t even know enough of the basics to be able to distinguish good and bad taste in use of type. The sign design field doesn’t pay well enough and the public at large doesn’t seem to care enough about maintaining certain standards of quality for that to happen. What, and Helvetica is the all-American typeface? I have an interview with Adrian Frutiger on videotape where he says that his own Univers is not at all suited for signage. That’s why he designed Frutiger as far back as 1976 (it was originally sketched as Concorde in the early 60s but forgotten, or too good for its time). Helvetica triumphs as the face without character. While that may make it suitable for anything that is trying to be neutral, dull or cool (that always depends on your view), it makes it totally unsuitable for usage where single letters need to be recognized rather than wordshapes. That applies even more to figures. And the weights are all wrong. Reversed-out type needs to be lighter than dark on light letters, and back-lit signs need to be different again. Helvetica Medium is, in fact, one of the worst choices for signage. It may have become a default by its sheer omnipresence, but the decisions to use it either come from a time when there was little choice (at least for the laymen who usually make these decisions without any professional advice) or from that kind of lack of interest displayed by some people’s comments to this topic. Public signage is not about “good enough”, but about doing the best for the public. That is you and me. For the price of a single shell fired by the military I could design a pretty decent system for BART. I don’t disagree at all that Univers and Helvetica are poor choices for signage systems. I do, however, think that we as designers need to take into account cultural normalcy – what people are accustomed to seeing – and strike a balance between cultural factors and factors of readability. By saying that signs should be “unnoticed,” I meant that they should be transparent – simply tell people where they need to go, but don’t attract attention as an object. This seems particularly important for road signs. Why fix it if it isn�t broken? In the case of New York, it is broken.The system is rapidly deteriorating as we speak. As far as “cultural normalcy” I can only agree with this up to a point. The problem often with a term like “cultural normalcy” is that equates to many other types of issues and problems. Cultural normalcy often means complacency. Cultural normalcy in many parts of the country also means intolerance.While it is often the job of the designer to “solve a problem” solving a problem might also mean breaking new ground and approaching an idea from a fresh perspective. I never could understand why the road signs (as I remember it) are all caps in the US. They largely were in Italy too, I believe. Seems an odd choice when surely word-shape recognition is the most important function of the signage. I was absolutely appalled at the recent “renovation” of the walls of the BART stations downtown. The old design had different colors in Montgomery and Powell stations, and that was interesting enough. Not to mention that Embarcadero had great marble walls with texture and grit, which were painted white! Who the @#$% had the bright idea to paint marble??? So to royally screw up the fonts of the signs in the stations was not a surprise, as visually unpleasant as it is. I wrote a long letter to the BART people criticizing them for their lack of taste and artistic expression. This is a mass transit system, with millions of people passing through it each week. The least they could do is spend some time thinking about being modern and innovative and different, just like BART was made to be thirty years ago. They didn’t have to spend a billion on the refurb, either. But they didn’t try, and this is what we’re left with. Drab drab drab. In San Francisco of all places! The signs are set all caps on most two lane highways and four lane roads with at-grade crossings. Limited access Interstate style roads have upper and lowercase signs. On a recent drive through the Texas Panhandle I noticed many highway signs, not just the Interstates being replaced with type using ClearviewHwy. All the new signs were set with upper and lowercase lettering, even on two lane roads. I had no idea they’d painted Embarcadero as well. I rarely take BART, and haven’t been to Embarcadero on Muni Metro lately, and Embarcadero always stuck me as better designed because as the marble walls get dirty it brings out the angular lines and details cut into the walls. Its a rare acknowledgment of the reality that train stations are train stations. Now, what I really wanted to say is that before talking about the mismatched typefaces, lets get off the station platform and back to the mezzanine… All too often arial would be a step up from the hand written signs posted at station booths in Downtown SF, Muni is even worse with often half a dozen hand written signs like “this is not BART” posted next to another reading “for exact change go to BART ticket machines and press H”. Muni’s use of type (or rather lack of) is much worse then BART, but it’s pretty much irrelevant because they share facilities and anyone entering the station will be confronted with Muni’s signs as well, even if they’re only there for BART. I think the situation backs up the idea of giving BART stations a flavor of that city as well, because at different places BART shares station facilities with SamTrans, Caltrain, Muni, AC Transit, Amtrak, ACE and how many other local agencies? Even if BART were to come up with very consistent signs with good type that support easy wayfinding, they would not work with every other system. Forgive-me if I may sound rude, Mr. Coles, but did you mean to say that in the third world we don’t have any good quality signage? From the coments I’ve read in this post, I think here (In Bras�lia, Brazil, where I live) the subway signage is pretty good, maybe even better than that of San Fransisco. Anyway, I belive the major diference from our subway systems is that here in the third world we don’t have terrorists, so we can always take our trains with no fear of being exploded, no matter what happens with you and your political affairs from the first world. Snap! Thanks for putting me in my place, Alexandre. My wording was obviously careless. Is Brazil a third world country? i’m glad someone finally made a comment about Mr. Cole’s use of “third world” as a metaphor for an unpleasant experience. as a a resident and citizen of the first world, but loyal to my third world roots, i took offense to that comment and felt it was entirely uneccessary to use in relation to a discussion on type. other than that, however, as a student of graphic design in toronto, canada i thoroughly enjoyed reading through this discussion and found it very useful in my exploration of typography and its function in society. What a relief! At the time I wrote my last comment I was very angry! But anyway, we all commit mistakes don’t we? I’m still a fan of typographica! And yes, Brazil is a third world country. (At least I learned that in school). In Los Angeles, the aforementioned Metro Rail and Metro Line use Scala Sans Bold. Also, the city of Lawndale just south of LA uses Scala Sans for a lot of their street signage, at least along Hawthorne Blvd. They have markers with the city name at public parking lots, and I believe the converted the street name plates on every corner to Scala Sans, with oldstyle numerals and uppper- and lowercase letters to boot! those boston signs are beautiful. They look straight out of a 1950s butcher shop.